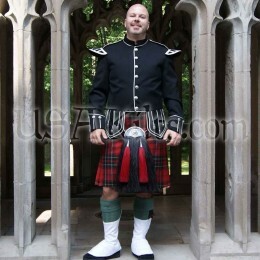 An exclusive USA Kilts design! Our latest and greatest pewter kilt belt buckle just for firefighters. We designed it, then contracted one of the best pewter foundries in the United Kingdom to cast it just for us. It proudly displays the beloved Maltese cross, helmet, hook & ladder and hydrant symbols of this hard profession. All surrounded by rich Celtic knot roping. A perfect gift for the firefighter in your life.